Express Sweepstakes: Win a $50 Gift Card from Express (Facebook)! Express has a fun sweepstakes going on! All you have to do is "Like" Express on Facebook and then you can enter daily to win a $50 gift card! Well, they are at 592, 949 fans right now . 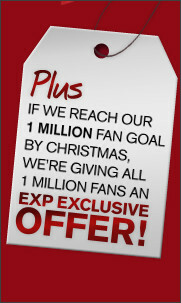 . . but I'm curious about the exclusive offer!! !